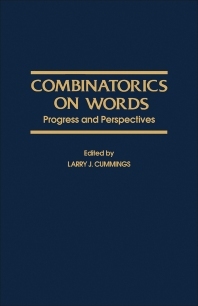 Combinatorics on Words: Progress and Perspectives covers the proceedings of an international meeting by the same title, held at the University of Waterloo, Canada on August 16-22, 1982. This meeting highlights the diverse aspects of combinatorics on words, including the Thue systems, topological dynamics, combinatorial group theory, combinatorics, number theory, and computer science. This book is organized into four parts encompassing 19 chapters. The first part describes the Thue systems with the Church-Rosser property. A Thue system will be called “Church-Rosser” if two strings are congruent with respect to that system if and only if they have a common descendant, that is, a string that can be obtained applying only rewriting rules that reduce length. The next part deals with the problems related to the encoding of codes and the overlapping of words in rational languages. This part also explores the features of polynomially bounded DOL systems yield codes. These topics are followed by discussions of some combinatorial properties of metrics over the free monoid and the burnside problem of semigroups of matrices. The last part considers the ambiguity types of formal grammars, finite languages, computational complexity of algebraic structures, and the Bracket-context tree functions. This book will be of value to mathematicians and advance undergraduate and graduate students.